[Gordon] sent us a tip about this simple laser trip wire system after reading yesterday’s post on a more complicated laser security unit. That build did a lot to provide functionality, such as a system to disarm the trip wire, and a robust light detection circuit. This time around there’s more happening with smoke and mirrors than with electronics. [The Timmy] built this simpler version based on a laser trip system from Afrotechmods (video of that one is embedded after the break). He had a bag full of small square mirrors which he attached to a wall with some poster putty. 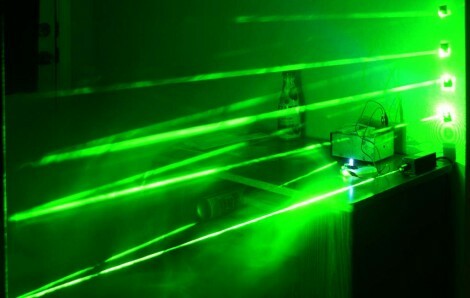 A laser module shines a beam of light onto a cadmium sulfide sensor after it bounces around the optical network for a while. That CdS sensor controls an N-channel MOSFET, switching it off when light is detected and on when the intensity of the laser is absent. This example just turns an LED on and off, but since it uses logic-level voltages you can choose to add a microcontroller to the mix if you have other plans in mind. And you will have a laser trip wire that can pshhhhh haha funny but this could proove very usefull for my killing robot!! Man that’s a simple circuit. Wouldn’t you want to grab an SCR instead of the MOSFET to make it latch-on when tripped? Maybe a 555 to time the alarm so it goes on for a couple minutes? Couldn’t you still bypass it with a small laser that you carry if you point at the CDs?? Yeah. The proof of concept can be defeated just by putting a flashlight on it. But that’s where the micro controller and/or pc interface comes in– you can modulate the beam and have the sensor circuit expect that pattern (for example: a cycling encrypted code), and then it suddenly gets just a little trickier to trick. Having seen many caper flix where they pop a mirror into the path to bypass the circuit, I hope you allow for this and for flying bugs. i build a laser trip wire for a theater show, the detector was a bit low tech though, the light operator had to press the “cue GO” button when the actor walked into the beam. the biggest problem we had was our laser system was a disco laser scanner, with moving mirrors controlled by stepper motors, being made in china it didn’t always go to the same place as programmed. so i took the stepper motors out, then all was good. apart from the 4 mirrors, which had to be lined up perfectly or the laser wouldn’t reach the end of its path. we put them on big heavy stands, so they wouldn’t move when people walked past them onstage. and even then we still had to like them up right at the begining of the show, just to be sure. Man afrotechmods is the source of some pretty good stuff. Could a bistable 555 be configured to make the circuit latch? yeah, if you check out the forum that covers this project, I believe there is a circuit involving a 555. I just used couple of relays to my handle latching and de-latching. it’s great for an automatic dispenser on a balance scale. Why buy a foto resistor when your could use any npn transistor in TO-5 casing for free? Simply cut off the top of casing and voila you’ve got a foto transistor. is there an equivalent for the IRFZ44? can you please tell me what materials i need to make this….can i use a 9v battery to give output to a electric igniter.